FreeCharge, is a best Digital payment platform which we can trust 100%. Also it gives offers every time when use it for bill payments or recharge. 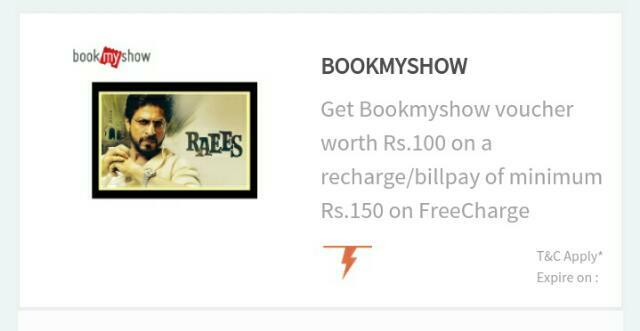 Now it again giving another offer with BookMyShow From which we can grab Free Rs.100 BookMyShow Voucher. With BookMyShow’s application you can now book tickets for movies, plays, concerts, sports and many other events happening in your city. You can book and buy movie tickets online.BookMyShow app also lets you check movie show timings, theatre lists, read reviews & news. Just follow the Below instructions to Grab Rs.100 BookMyShow Voucher. – Select the movie, show and seat of your choice on mobile app, or website. -Confirm your email id & mobile number as this information will be used to confirm your transaction. – Then enter your unique code in the promo code box. – Click on “Apply”, and the discount amount will get applied. – Complete your payment and you are Done ! – Use code BMS and recharge for minimum Rs. 150. – They reserve the right to restrict cashback for any account with suspicious behavior or invalid details/credentials. – Book 2 or more movie tickets on BookMyShow and get Rs.100 off or 50% off on transaction value, whichever is lower. – The code is valid till 30th April, 2017 23:59 hours. – The discount Code is valid only on movie transactions and can be redeemed on BookMyShow mobile app and website. – Please update your mobile app and avail the offer. – The discount is applicable only on ticket price, and excludes all fees and taxes. – BookMyShow reserves the right to withdraw or modify this offer at any time without prior notice. – In case of any dispute, the decision of BookMyShow will be final. – This offer cannot be combined with any other offers/discounts/promotions at BookMyShow.